The earliest recorded example of the use of an internal combustion engine in a railway locomotive is the prototype designed by William Dent Priestman, which was examined by Sir William Thomson in 1888 who described it as a "[Priestman oil engine] mounted upon a truck which is worked on a temporary line of rails to show the adaptation of a petroleum engine for locomotive purposes.". In 1894, a 20 hp (15 kW) two axle machine built by Priestman Brothers was used on the Hull Docks. In 1896 an oil-engined railway locomotive was built for the Royal Arsenal, Woolwich, England, in 1896, using an engine designed by Herbert Akroyd Stuart. It was not, strictly, a diesel because it used a hot bulb engine (also known as a semi-diesel) but it was the precursor of the diesel. Following the expiration of Dr. Rudolf Diesel's patent in 1912, his engine design was successfully applied to marine propulsion and stationary applications. However, the massiveness and poor power-to-weight ratio of these early engines made them unsuitable for propelling land-based vehicles. Therefore, the engine's potential as a railroad prime mover was not initially recognized. This changed as development reduced the size and weight of the engine. In 1906, Rudolf Diesel, Adolf Klose and the steam and diesel engine manufacturer Gebrüder Sulzer founded Diesel-Sulzer-Klose GmbH to manufacture diesel-powered locomotives. Sulzer had been manufacturing Diesel engines since 1898. The Prussian State Railways ordered a diesel locomotive from the company in 1909, and after test runs between Winterthur and Romanshorn the diesel–mechanical locomotive was delivered in Berlin in September 1912. The world's first diesel-powered locomotive was operated in the summer of 1912 on the Winterthur–Romanshorn railroad in Switzerland, but was not a commercial success. During further test runs in 1913 several problems were found. After the First World War broke out in 1914, all further trials were stopped. The locomotive weight was 95 tonnes and the power was 883 kW with a maximum speed of 100 km/h. Small numbers of prototype diesel locomotives were produced in a number of countries through the mid-1920s. Adolphus Busch purchased the American manufacturing rights for the diesel engine in 1898 but never applied this new form of power to transportation. He founded the Busch-Sulzer company in 1911. Only limited success was achieved in the early twentieth century with internal combustion engined railcars, due, in part, to difficulties with mechanical drive systems. General Electric (GE) entered the railcar market in the early twentieth century, as Thomas Edison possessed a patent on the electric locomotive, his design actually being a type of electrically propelled railcar. GE built its first electric locomotive prototype in 1895. However, high electrification costs caused GE to turn its attention to internal combustion power to provide electricity for electric railcars. Problems related to co-coordinating the prime mover and electric motor were immediately encountered, primarily due to limitations of the Ward Leonard current control system that had been chosen. A significant breakthrough occurred in 1914, when Hermann Lemp, a GE electrical engineer, developed and patented a reliable direct current electrical control system (subsequent improvements were also patented by Lemp). Lemp's design used a single lever to control both engine and generator in a coordinated fashion, and was the prototype for all internal combustion–electric drive control systems. In 1917–18, GE produced three experimental diesel–electric locomotives using Lemp's control design, the first known to be built in the United States. Following this development, the 1923 Kaufman Act banned steam locomotives from New York City because of severe pollution problems. The response to this law was to electrify high-traffic rail lines. However, electrification was uneconomical to apply to lower-traffic areas. The first regular use of diesel–electric locomotives was in switching (shunter) applications, which were more forgiving than mainline applications of the limitations of contemporary diesel technology and where the idling economy of diesel relative to steam would be most beneficial. GE entered a collaboration with the American Locomotive Company (ALCO) and Ingersoll-Rand (the "AGEIR" consortium) in 1924 to produce a prototype 300 hp (220 kW) "boxcab" locomotive delivered in July 1925. This locomotive demonstrated that the diesel–electric power unit could provide many of the benefits of an electric locomotive without the railroad having to bear the sizeable expense of electrification. The unit successfully demonstrated, in switching and local freight and passenger service, on ten railroads and three industrial lines. Westinghouse Electric and Baldwin collaborated to build switching locomotives starting in 1929. However, the Great Depression curtailed demand for Westinghouse's electrical equipment, and they stopped building locomotives internally, opting to supply electrical parts instead. In June 1925, Baldwin Locomotive Works outshopped a prototype diesel–electric locomotive for "special uses" (such as for runs where water for steam locomotives was scarce) using electrical equipment from Westinghouse Electric Company. Its twin-engine design was not successful, and the unit was scrapped after a short testing and demonstration period. Industry sources were beginning to suggest “the outstanding advantages of this new form of motive power”. In 1929, the Canadian National Railways became the first North American railway to use diesels in mainline service with two units, 9000 and 9001, from Westinghouse. However, these early diesels proved expensive and unreliable, with their high cost of acquisition relative to steam unable to be realized in operating cost savings as they were frequently out of service. It would be another five years before diesel-electric propulsion would be successfully used in mainline service, and nearly ten years before it would show real potential to fully replace steam. Before diesel power could make inroads into mainline service, the limitations of diesel engines circa 1930 - low power-to-weight ratios and narrow output range - had to be overcome. A major effort to overcome those limitations was launched by General Motors after they moved into the diesel field with their acquisition of the Winton Engine Company, a major manufacturer of diesel engines for marine and stationary applications, in 1930. Supported by the General Motors Research Division, GM's Winton Engine Corporation sought to develop diesel engines suitable for high speed mobile use. The first milestone in that effort was delivery in early 1934 of the Winton 201A, a two-stroke, Roots-blown, uniflow-scavenged, unit-injected diesel engine that could deliver the required performance for a fast, lightweight passenger train. The second milestone, and the one that got American railroads moving towards diesel, was the 1938 delivery of GM's Model 567 engine that was designed specifically for locomotive use, bringing a fivefold increase in life of some mechanical parts and showing its potential for meeting the rigors of freight service. Diesel–electric railroad locomotion entered mainline service when the Burlington Railroad and Union Pacific used custom-built diesel "streamliners" to haul passengers, starting in late 1934.Burlington's Zephyr trainsets evolved from articulated three car sets with 600 hp power cars in 1934 and early 1935, to the Denver Zephyr semi-articulated ten car trainsets pulled by cab-booster power sets introduced in late 1936. Union Pacific started diesel streamliner service between Chicago and Portland Oregon in June 1935, and in the following year would add Los Angeles and Oakland California, and Denver Colorado to the destinations of diesel streamliners out of Chicago. The Burlington and Union Pacific streamliners were built by the Budd Company and the Pullman-Standard Company, respectively, using the new Winton engines and power train systems designed by GM's Electro-Motive Corporation. EMC's experimental 1800 hp B-B locomotives of 1935 demonstrated the multiple-unit control systems used for the cab/booster sets and the twin engine format used with the later Zephyr power units. Both of those features would be used in EMC's later production model locomotives. The lightweight diesel streamliners of the mid-1930s demonstrated the advantages of diesel for passenger service with breakthrough schedule times, but diesel locomotive power would not fully come of age until regular series production of mainline diesel locomotives commenced and it was shown suitable for full-size passenger and freight service. Following their 1925 prototype, the AGEIR consortium produced 25 more units of 300 hp (220 kW) "60 ton" AGEIR boxcab switching locomotives between 1925 and 1928 for several New York City railroads, making them the first series-produced diesel locomotives. The consortium also produced seven twin-engine "100 ton" boxcabs and one hybrid trolley/battery unit with a diesel-driven charging circuit. ALCO acquired the McIntosh & Seymour Engine Company in 1929 and entered series production of 300 hp (220 kW) and 600 hp (450 kW) single-cab switcher units in 1931. ALCO would be the pre-eminent builder of switch engines through the mid-1930s and would adapt the basic switcher design to produce versatile and highly successful, albeit relatively low powered, road locomotives. GM, seeing the success of the custom streamliners, sought to expand the market for diesel power by producing standardized locomotives under their Electro-Motive Corporation. In 1936 EMC's new factory started production of switch engines. In 1937 the factory started producing their new E series streamlined passenger locomotives, which would be upgraded with more reliable purpose-built engines in 1938. Seeing the performance and reliability of the new 567 model engine in passenger locomotives, EMC was eager to demonstrate diesel's viability in freight service. Following the successful 1939 tour of EMC's FT demonstrator freight locomotive set, the stage was set for dieselization of American railroads. In 1941 ALCO-GE introduced the RS-1 road-switcher that occupied its own market niche while EMD's F series locomotives were sought for mainline freight service. The US entry into World War II slowed conversion to diesel; the War Production Board put a halt to building new passenger equipment and gave naval uses priority for diesel engine production. During the petroleum crisis of 1942-43, coal-fired steam had the advantage of not using fuel that was in critically short supply. EMD was later allowed to increase production of its FT locomotives and ALCO-GE was allowed to produce a limited number of DL-109 road locomotives, but most in the locomotive business were restricted to making switch engines and steam locomotives. In the early postwar era, EMD dominated the market for mainline locomotives with their E and F series locomotives. ALCO-GE in the late 1940s produced switchers and road-switchers that were successful in the short-haul market. However, EMD launched their GP series road-switcher locomotives in 1949, which displaced all other locomotives in the freight market including their own F series locomotives. GE subsequently dissolved its partnership with ALCO and would emerge as EMD's main competitor in the early 1960s, eventually taking the top position in the locomotive market from EMD. Early diesel–electric locomotives in the United States used direct current (DC) traction motors, but alternating current (AC) motors came into widespread use in the 1990s, starting with the Electro-Motive SD70MAC in 1993 and followed by the General Electric's AC4400CW in 1994 and AC6000CW in 1995. In 1914, world's first functional diesel–electric railcars were produced for the Königlich-Sächsische Staatseisenbahnen (Royal Saxon State Railways) by Waggonfabrik Rastatt with electric equipment from Brown, Boveri & Cie and diesel engines from Swiss Sulzer AG. They were classified as DET 1 and DET 2 (de.wiki). Due to shortage of petrol products during World War I, they remained unused for regular service in Germany. In 1922, they were sold to Swiss Compagnie du Chemin de fer Régional du Val-de-Travers (fr.wiki), where they were used in regular service up to the electrification of the line in 1944. Afterwards, the company kept them in service as boosters till 1965. The engine Ээл2 (Eel2 original number Юэ 001/Yu-e 001) started on October 22. It had been designed by a team led by Yuri Lomonosov and built 1923–1924 by Maschinenfabrik Esslingen in Germany. It had 5 driving axles (1'E1'). After several test rides, it hauled trains for almost three decades from 1925 to 1954. Though proved to be world's first functional diesel locomotive, it did not become a series, but it became a model for several classes of Soviet diesel locomotives. The engine Щэл1 (Shch-el 1, original number Юэ2/Yu-e 2), started on November 9. It had been developed by Yakov Modestovich Gakkel (ru.wiki) and built by Baltic Shipyard in Saint Petersburg. It had ten driving axles in three bogies (1' Co' Do' Co' 1'). From 1925 to 1927, it hauled trains between Moscow and Kursk and in Caucasus region. Due to technical problems, afterwards it was out of service. Since 1934, it was used as a stationary electric generator. Diesel-powered or "oil-engined" railcars, generally diesel–mechanical, were developed by various European manufacturers in the 1930s, e.g. by William Beardmore and Company for the Canadian National Railways (the Beardmore Tornado engine was subsequently used in the R101 airship). Some of those series for regional traffic were begun with gasoline motors and then continued with diesel motors, such as Hungarian BCmot (The class code doesn't tell anything but "railmotor with 2nd and 3rd class seats". ), 128 cars built 1926 – 1937, or German Wismar railbuses (57 cars 1932 – 1941). In France, the first diesel railcar was Renault VH, 115 units produced 1933/34. In Italy, after 6 Gasoline cars since 1931, Fiat and Breda built a lot of diesel railmotors, more than 110 from 1933 to 1938 and 390 from 1940 to 1953, Class 772 known as Littorina, and Class ALn 900. In Germany, the Flying Hamburger was built in 1932. After a test ride in December 1932, this two coach diesel railcar (in English terminology a DMU2) started service at Deutsche Reichsbahn (DRG) in February 1933. It became the prototype of DRG Class SVT 137 with 33 more highspeed DMUs, built for DRG till 1938, 13 DMU 2 ("Hamburg" series), 18 DMU 3 ("Leipzig" and "Köln" series), and 2 DMU 4 ("Berlin" series). In 1945, a batch of 30 Baldwin diesel–electric locomotives, Baldwin 0-6-6-0 1000, was delivered from the United States to the railways of the Soviet Union. In 1947, the London Midland & Scottish Railway introduced the first of a pair of 1,600 hp (1,200 kW) Co-Co diesel–electric locomotives (later British Rail Class D16/1) for regular use in the United Kingdom, although British manufacturers such as Armstrong Whitworth had been exporting diesel locomotives since 1930. Fleet deliveries to British Railways, of other designs such as Class 20 and Class 31, began in 1957. One of the first home developed diesel vehicles of China was the DMU Dongfeng (东风), produced in 1958 by CSR Sifang. Series production of China's first diesel locomotive class, the DFH 1, began in 1964 following construction of a prototype in 1959. The Trans-Australian Railway built 1912 to 1917 by Commonwealth Railways (CR) passes through 2000 km of waterless (or salt watered) desert terrain unsuitable for steam locomotives. The original engineer Henry Deane envisaged diesel operation to overcome such problems. Some have suggested that the CR worked with the South Australian Railways to trial diesel traction. However, the technology was not developed enough to be reliable. Some Australian railway companies bought McKeen railcars. High speed vehicles for those days' possibilities on 3 ft 6 in (1,067 mm) were the 10 Vulcan railcars of 1940 for New Zealand. A diesel–mechanical locomotive uses a mechanical transmission in a fashion similar to that employed in most road vehicles. This type of transmission is generally limited to low-powered, low speed shunting (switching) locomotives, lightweight multiple units and self-propelled railcars. A British Rail Class 03 diesel–mechanical shunter with a jackshaft under the cab. The mechanical transmissions used for railroad propulsion are generally more complex and much more robust than standard-road versions. There is usually a fluid coupling interposed between the engine and gearbox, and the gearbox is often of the epicyclic (planetary) type to permit shifting while under load. Various systems have been devised to minimise the break in transmission during gear changing; e.g., the S.S.S. (synchro-self-shifting) gearbox used by Hudswell Clarke. Diesel–mechanical propulsion is limited by the difficulty of building a reasonably sized transmission capable of coping with the power and torque required to move a heavy train. A number of attempts to use diesel–mechanical propulsion in high power applications have been made (e.g., the 1,500 kW (2,000 hp) British Rail 10100 locomotive), although none have proved successful in the end. For locomotives powered by a combination of diesel or fuel cells and batteries or ultracapacitors, see hybrid train. In a diesel–electric locomotive, the diesel engine drives either an electrical DC generator (generally, less than 3,000 horsepower (2,200 kW) net for traction), or an electrical AC alternator-rectifier (generally 3,000 horsepower (2,200 kW) net or more for traction), the output of which provides power to the traction motors that drive the locomotive. There is no mechanical connection between the diesel engine and the wheels. 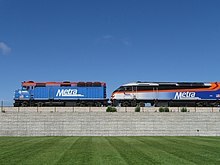 The EMD F40PH (left) and MPI MPXpress-series MP36PH-3S (right) locomotives coupled together by Metra use diesel–electric transmission. A diesel–electric locomotive's power output is independent of road speed, as long as the unit's generator current and voltage limits are not exceeded. Therefore, the unit's ability to develop tractive effort (also referred to as drawbar pull or tractive force, which is what actually propels the train) will tend to inversely vary with speed within these limits. (See power curve below). Maintaining acceptable operating parameters was one of the principal design considerations that had to be solved in early diesel–electric locomotive development and, ultimately, led to the complex control systems in place on modern units. Locomotive power output, and thus speed, is typically controlled by the engine driver using a stepped or "notched" throttle that produces binary-like electrical signals corresponding to throttle position. This basic design lends itself well to multiple unit (MU) operation by producing discrete conditions that assure that all units in a consist respond in the same way to throttle position. Binary encoding also helps to minimize the number of trainlines (electrical connections) that are required to pass signals from unit to unit. For example, only four trainlines are required to encode all possible throttle positions. North American locomotives, such as those built by EMD or General Electric, have nine throttle positions, one idle and eight power (as well as an emergency stop position that shuts down the prime mover). Many UK-built locomotives have a ten-position throttle. The power positions are often referred to by locomotive crews as "run 3" or "notch 3", depending upon the throttle setting. As will be seen in the following discussion, the propulsion system is designed to produce maximum traction motor torque at start-up, which explains why modern locomotives are capable of starting trains weighing in excess of 15,000 tons, even on ascending grades. Current technology allows a locomotive to develop as much as 30 percent of its loaded driver weight in tractive force, amounting to some 120,000 pounds-force (530 kN) of drawbar pull for a large, six-axle freight (goods) unit. In fact, a consist of such units can produce more than enough drawbar pull at start-up to damage or derail cars (if on a curve) or break couplers (the latter being referred to in North American railroad slang as "jerking a lung"). Therefore, it is incumbent upon the engine driver to carefully monitor the amount of power being applied at start-up to avoid damage. In particular, "jerking a lung" could be a calamitous matter if it were to occur on an ascending grade, except that the safety inherent in the correct operation of automatic train brakes installed in wagons today, prevents runaway trains by automatically applying the wagon brakes when train line air pressure drops. A locomotive's control system is designed so that the main generator electrical power output is matched to any given engine speed. Given the innate characteristics of traction motors, as well as the way in which the motors are connected to the main generator, the generator will produce high current and low voltage at low locomotive speeds, gradually changing to low current and high voltage as the locomotive accelerates. Therefore, the net power produced by the locomotive will remain constant for any given throttle setting (see power curve graph for notch 8). In older designs, the prime mover's governor and a companion device, the load regulator, play a central role in the control system. The governor has two external inputs: requested engine speed, determined by the engine driver's throttle setting, and actual engine speed (feedback). The governor has two external control outputs: fuel injector setting, which determines the engine fuel rate, and load regulator position, which affects main generator excitation. The governor also incorporates a separate overspeed protective mechanism that will immediately cut off the fuel supply to the injectors and sound an alarm in the cab in the event the prime mover exceeds a defined RPM. Not all of these inputs and outputs are necessarily electrical. The load regulator is essentially a large potentiometer that controls the main generator power output by varying its field excitation and hence the degree of loading applied to the engine. The load regulator's job is relatively complex, because although the prime mover's power output is proportional to RPM and fuel rate, the main generator's output is not (which characteristic was not correctly handled by the Ward Leonard elevator- and hoist-type drive system that was initially tried in early locomotives). Instead, a quite complex electro-hydraulic Woodward governor was employed. Today, this important function would be performed by the Engine control unit, itself being a part of the Locomotive control unit. In newer designs controlled by a “traction computer,” each engine speed step is allotted an appropriate power output, or “kW reference”, in software. The computer compares this value with actual main generator power output, or “kW feedback”, calculated from traction motor current and main generator voltage feedback values. The computer adjusts the feedback value to match the reference value by controlling the excitation of the main generator, as described above. The governor still has control of engine speed, but the load regulator no longer plays a central role in this type of control system. However, the load regulator is retained as a “back-up” in case of engine overload. Modern locomotives fitted with electronic fuel injection (EFI) may have no mechanical governor; however a “virtual” load regulator and governor are retained with computer modules. At standstill, main generator output is initially low voltage/high current, often in excess of 1000 amperes per motor at full power. When the locomotive is at or near standstill, current flow will be limited only by the DC resistance of the motor windings and interconnecting circuitry, as well as the capacity of the main generator itself. Torque in a series-wound motor is approximately proportional to the square of the current. Hence, the traction motors will produce their highest torque, causing the locomotive to develop maximum tractive effort, enabling it to overcome the inertia of the train. This effect is analogous to what happens in an automobile automatic transmission at start-up, where it is in first gear and thus producing maximum torque multiplication. As the locomotive accelerates, the now-rotating motor armatures will start to generate a counter-electromotive force (back EMF, meaning the motors are also trying to act as generators), which will oppose the output of the main generator and cause traction motor current to decrease. Main generator voltage will correspondingly increase in an attempt to maintain motor power, but will eventually reach a plateau. At this point, the locomotive will essentially cease to accelerate, unless on a downgrade. Since this plateau will usually be reached at a speed substantially less than the maximum that may be desired, something must be done to change the drive characteristics to allow continued acceleration. This change is referred to as "transition," a process that is analogous to shifting gears in an automobile. Reconnecting the two separate internal main generator stator windings of two rectifiers from parallel to series to increase the output voltage. In older locomotives, it was necessary for the engine driver to manually execute transition by use of a separate control. As an aid to performing transition at the right time, the load meter (an indicator that shows the engine driver how much current is being drawn by the traction motors) was calibrated to indicate at which points forward or backward transition should take place. Automatic transition was subsequently developed to produce better operating efficiency and to protect the main generator and traction motors from overloading from improper transition. A common option on diesel–electric locomotives is dynamic (rheostatic) braking. The armature of each traction motor is connected across a forced-air-cooled resistance grid (the dynamic braking grid) in the roof of the locomotive's hood. Dynamic braking is particularly beneficial when operating in mountainous regions; where there is always the danger of a runaway due to overheated friction brakes during descent. In such cases, dynamic brakes are usually applied in conjunction with the air brakes, the combined effect being referred to as blended braking. The use of blended braking can also assist in keeping the slack in a long train stretched as it crests a grade, helping to prevent a "run-in", an abrupt bunching of train slack that can cause a derailment. Blended braking is also commonly used with commuter trains to reduce wear and tear on the mechanical brakes that is a natural result of the numerous stops such trains typically make during a run. Metro-North's GE Genesis P32AC-DM electro-diesel locomotive can also operate off of third-rail electrification. These special locomotives can operate as an electric locomotive or as a diesel locomotive. The Long Island Rail Road, Metro-North Railroad and New Jersey Transit Rail Operations operate dual-mode diesel–electric/third-rail (catenary on NJTransit) locomotives between non-electrified territory and New York City because of a local law banning diesel-powered locomotives in Manhattan tunnels. For the same reason, Amtrak operates a fleet of dual-mode locomotives in the New York area. British Rail operated dual diesel–electric/electric locomotives designed to run primarily as electric locomotives with reduced power available when running on diesel power. This allowed railway yards to remain un-electrified, as the third rail power system is extremely hazardous in a yard area. Hydraulic drive systems using a hydrostatic hydraulic drive system have been applied to rail use. Modern examples included 350 to 750 hp (260 to 560 kW) shunting locomotives by CMI Group (Belgium), 4 to 12 tonne 35 to 58 kW (47 to 78 hp) narrow gauge industrial locomotives by Atlas Copco subsidiary GIA. Hydrostatic drives are also utilised in railway maintenance machines (tampers, rail grinders). Application of hydrostatic transmissions is generally limited to small shunting locomotives and rail maintenance equipment, as well as being used for non-tractive applications in diesel engines such as drives for traction motor fans. British Rail diesel–hydraulic locomotives: Class 52 "Western", Class 42 "Warship" and Class 35 "Hymek"
Diesel–hydraulic locomotives are less efficient than diesel–electrics. The first-generation BR diesel hydraulics were significantly less efficient (c. 65%) than diesel electrics (c. 80%) — moreover initial versions were found in many countries to be mechanically more complicated and more likely to break down. Hydraulic transmission for locomotives was developed in Germany. There is still debate over the relative merits of hydraulic vs. electrical transmission systems: advantages claimed for hydraulic systems include lower weight, high reliability, and lower capital cost. In Germany and Finland, diesel–hydraulic systems have achieved high reliability in operation. In the UK the diesel–hydraulic principle gained a poor reputation due to the poor durability and reliability of the Maybach Mekydro hydraulic transmission. Argument continues over the relative reliability of hydraulic systems, with questions over whether data has been manipulated to favour local suppliers over non-German ones. Diesel–hydraulic drive is common in multiple units, with various transmission designs used including Voith torque converters, and fluid couplings in combination with mechanical gearing. The majority of British Rail's second generation passenger DMU stock used hydraulic transmission. In the 21st century designs using hydraulic transmission include Bombardier's Turbostar, Talent, RegioSwinger families; diesel engined versions of Siemens's Desiro platform, and the Stadler Regio-Shuttle. Other main-line locomotives of the post war period included the 1950s GMD GMDH-1 experimental locomotives; the Henschel & Son built South African Class 61-000; in the 1960s Southern Pacific bought 18 Krauss-Maffei KM ML-4000 diesel–hydraulic locomotives. The Denver & Rio Grande Western also bought three, all of which were later sold to SP. In the 21st century series production standard gauge diesel–hydraulic designs include the Voith Gravita, ordered by Deutsche Bahn, and the Vossloh G2000, G1206 and G1700 designs, all manufactured in Germany for freight use. The diesel-pneumatic locomotive was of interest in the 1930s because it offered the possibility of converting existing steam locomotives to diesel operation. The frame and cylinders of the steam locomotive would be retained and the boiler would be replaced by a diesel engine driving an air compressor. The problem was low thermal efficiency because of the large amount of energy wasted as heat in the air compressor. Attempts were made to compensate for this by using the diesel exhaust to re-heat the compressed air but these had limited success. A German proposal of 1929 did result in a prototype but a similar British proposal of 1932, to use an LNER Class R1 locomotive, never got beyond the design stage. Most diesel locomotives are capable of multiple unit operation (MU) as a means of increasing horsepower and tractive effort when hauling heavy trains. All North American locomotives, including export models, use a standardized AAR electrical control system interconnected by a 27-pin jumper cable between the units. For UK-built locomotives, a number of incompatible control systems are used, but the most common is the Blue Star system, which is electro-pneumatic and fitted to most early diesel classes. A small number of types, typically higher-powered locomotives intended for passenger only work, do not have multiple control systems. In all cases, the electrical control connections made common to all units in a consist are referred to as trainlines. The result is that all locomotives in a consist behave as one in response to the engine driver's control movements. The ability to couple diesel–electric locomotives in an MU fashion was first introduced in the EMD FT four-unit demonstrator that toured the United States in 1939. At the time, American railroad work rules required that each operating locomotive in a train had to have on board a full crew. EMD circumvented that requirement by coupling the individual units of the demonstrator with drawbars instead of conventional knuckle couplers and declaring the combination to be a single locomotive. Electrical interconnections were made so one engine driver could operate the entire consist from the head-end unit. Later on, work rules were amended and the semi-permanent coupling of units with drawbars was eliminated in favour of couplers, as servicing had proved to be somewhat cumbersome owing to the total length of the consist (about 200 feet or nearly 61 meters). In mountainous regions, it is common to interpose helper locomotives in the middle of the train, both to provide the extra power needed to ascend a grade and to limit the amount of stress applied to the draft gear of the car coupled to the head-end power. The helper units in such distributed power configurations are controlled from the lead unit's cab through coded radio signals. Although this is technically not an MU configuration, the behaviour is the same as with physically interconnected units. Cab arrangements vary by builder and operator. Practice in the U.S. has traditionally been for a cab at one end of the locomotive with limited visibility if the locomotive is not operated cab forward. This is not usually a problem as U.S. locomotives are usually operated in pairs, or threes, and arranged so that a cab is at each end of each set. European practice is usually for a cab at each end of the locomotive as trains are usually light enough to operate with one locomotive. Early U.S. practice was to add power units without cabs (booster or B units) and the arrangement was often A-B, A-A, A-B-A, A-B-B, or A-B-B-A where A was a unit with a cab. Center cabs were sometimes used for switch locomotives. In North American railroading, a cow-calf set is a pair of switcher-type locomotives: one (the cow) equipped with a driving cab, the other (the calf) without a cab, and controlled from the cow through cables. Cow-calf sets are used in heavy switching and hump yard service. Some are radio controlled without an operating engineer present in the cab. This arrangement is also known as master-slave. Where two connected units were present, EMD called these TR-2s (approximately 2,000 hp or 1,500 kW); where three units, TR-3s (approximately 3,000 hp or 2,200 kW). A Canadian National Railway train showing the placement of the headlight and ditch lights on the locomotive. The lights fitted to diesel locomotives vary from country to country. North American locomotives are fitted with two headlights (for safety in case one malfunctions) and a pair of ditch lights. The latter are fitted low down at the front and are designed to make the locomotive easily visible as it approaches a grade crossing. Older locomotives may be fitted with a Gyralite or Mars Light instead of the ditch lights. Although diesel locomotives generally emit less sulphur dioxide, a major pollutant to the environment, and greenhouse gases than steam locomotives, they are not completely clean in that respect. Furthermore, like other diesel powered vehicles, they emit nitrogen oxides and fine particles, which are a risk to public health. In fact, in this last respect diesel locomotives may perform worse than steam locomotives. For years, it was thought by American government scientists who measure air pollution that diesel locomotive engines were relatively clean and emitted far less health-threatening emissions than those of diesel trucks or other vehicles; however, the scientists discovered that because they used faulty estimates of the amount of fuel consumed by diesel locomotives, they grossly understated the amount of pollution generated annually (In Europe, where most major railways have been electrified, there is less concern). After revising their calculations, they concluded that the annual emissions of nitrogen oxide, a major ingredient in smog and acid rain, and soot would be by 2030 nearly twice what they originally assumed. This would mean that diesel locomotives would be releasing more than 800,000 tons of nitrogen oxide and 25,000 tons of soot every year within a quarter of a century, in contrast to the EPA's previous projections of 480,000 tons of nitrogen dioxide and 12,000 tons of soot. Since this was discovered, to reduce the effects of the diesel locomotive on humans (who are breathing the noxious emissions) and on plants and animals, it is considered practical to install traps in the diesel engines to reduce pollution levels and other forms (e.g., use of biodiesel). In 2008, the United States Environmental Protection Agency (EPA) mandated regulations requiring all new or refurbished diesel locomotives to meet Tier II pollution standards that slash the amount of allowable soot by 90% and require an 80% reduction in nitrogen oxide emissions. See List of low emissions locomotives. Other technologies that are being deployed to reduce locomotive emissions and fuel consumption include "Genset" switching locomotives and hybrid Green Goat designs. Genset locomotives use multiple smaller high-speed diesel engines and generators (generator sets), rather than a single medium-speed diesel engine and a single generator. Because of the cost of developing clean engines, these smaller high-speed engines are based on already developed truck engines. Green Goats are a type of hybrid switching locomotive utilizing a small diesel engine and a large bank of rechargeable batteries. Switching locomotives are of particular concern as they typically operate in a limited area, often in or near urban centers, and spend much of their time idling. Both designs reduce pollution below EPA Tier II standards and cut or eliminate emissions during idle. As diesel locomotives advanced, the cost of manufacturing and operating them dropped, and they became cheaper to own and operate than steam locomotives. In North America, steam locomotives were custom-made for specific railway routes, so economies of scale were difficult to achieve. Though more complex to produce with exacting manufacturing tolerances (1⁄10000-inch or 0.0025-millimetre for diesel, compared with 1⁄100-inch (0.25 mm) for steam), diesel locomotive parts were easier to mass produce. Baldwin Locomotive Works offered almost five hundred steam models in its heyday, while EMD offered fewer than ten diesel varieties.. In the United Kingdom, British Railways built steam locomotives to standard designs from 1951 onwards. These included standard, interchangeable parts, and were cheaper to produce than the diesel locomotives then available. The capital cost per drawbar horse power was £13 6s (steam), £65 (diesel), £69 7s (turbine) and £17 13s (electric). Diesel locomotives offer significant operating advantages over steam locomotives. They can safely be operated by one person, making them ideal for switching/shunting duties in yards (although for safety reasons many main-line diesel locomotives continue to have 2-man crews: an engineer and a conductor/switchman) and the operating environment is much more attractive, being quieter, fully weatherproof and without the dirt and heat that is an inevitable part of operating a steam locomotive. Diesel locomotives can be worked in multiple with a single crew controlling multiple locomotives in a single train — something not practical with steam locomotives. This brought greater efficiencies to the operator, as individual locomotives could be relatively low-powered for use as a single unit on light duties but marshaled together to provide the power needed on a heavy train. With steam traction a single very powerful and expensive locomotive was required for the heaviest trains or the operator resorted to double heading with multiple locomotives and crews, a method which was also expensive and brought with it its own operating difficulties. Steam engines required large quantities of coal and water, which were expensive variable operating costs. Further, the thermal efficiency of steam was considerably less than that of diesel engines. Diesel's theoretical studies demonstrated potential thermal efficiencies for a compression ignition engine of 36% (compared with 6–10% for steam), and an 1897 one-cylinder prototype operated at a remarkable 26% efficiency. By the mid-1960s, diesel locomotives had effectively replaced steam locomotives where electric traction was not in use. Attempts to develop advanced steam technology continue in the 21st century but have not made a significant impact. ^ Churella 1998, p. 15. ^ a b Stover, John F. (1997). American Railroads. Chicago, Illinois: The University of Chicago Press. p. 212. ISBN 978-0-226-77658-3. ^ Edison, Thomas A. U.S. Patent No. 493,425, filed January 19, 1891, and issued March 14, 1891 Accessed via the Edison Papers at: US Patent #493,425 on February 8, 2007. ^ Churella 1998, pp. 25-27. ^ Churella 1998, p. 27. ^ a b Kettering, E.W. (29 November 1951). History and Development of the 567 Series General Motors Locomotive Engine (PDF). ASME 1951 Annual Meeting. Atlantic City, New Jersey: Electro-Motive Division, General Motors Corporation. Retrieved 6 January 2015. ^ Pinkepank 1973, p. 209–211. ^ "vecchia loco ferrovie della Calabria - Ferrovie.it". www.ferrovie.it. ^ "The first russian diesel locos". izmerov.narod.ru. ^ "DD50 5　DD50 2｜随時アップ：消えた車輌写真館｜鉄道ホビダス". rail.hobidas.com. ^ "A German Diesel-Pneumatic Locomotive". Douglas-self.com. Retrieved 2011-08-20. ^ "Development of the Flameproof Diesel Vehicle Applied New Exhaust Gas Dry Type Treatment System". Sciencelinks.jp. 2009-03-18. Archived from the original on 2012-02-17. Retrieved 2011-08-20. ^ King, Joe (2008-09-22). "Engineering gets $1 million grant to make locomotives leaner, greener". Northern Illinois University. Archived from the original on 2012-09-10. Retrieved 2011-08-06. ^ Eilperin, Juliet (2006-08-14). "Attention to Locomotives' Emissions Renewed". Washington Post. Retrieved 2011-08-06. ^ Hawthorne, Michael (February 14, 2011). "Metra finds 'alarming' pollution on some trains". Chicago Tribune. Retrieved 2011-08-06. ^ Wilkins, Davell (2011-04-13). "Study: Installed Traps In Diesel Engines Reduce Pollution Levels". Top News. Retrieved 2011-08-06. ^ "Pollution on Metra Trains Worse Than Thought: Report". Fox Chicago News. 2011-02-14. Retrieved 2011-08-06. ^ Lydersen, Kari (April 21, 2011). "Black Carbon Testing Finds High Levels". The New York Times. Retrieved August 6, 2011. ^ "Multi-Engine GenSet Ultra Low Emissions Road-Switcher Locomotive" (PDF). National Railway Equipment Company. Retrieved 2012-06-03. ^ "Railpower Technologies Products". Archived from the original on January 14, 2008. Retrieved 2012-06-03. ^ RJ Corman Railpower Genset & Hybrid Switchers. Trainweb.org. Retrieved on 2013-08-16. ^ Churella 1998, p. 10. ^ Churella 1998, p. 19. ^ SmartStart® IIe - Automatic Engine Start/Stop System. Ztr.com. Retrieved on 2013-08-16. ^ Churella 1998, pp. 12-17. ^ Churella 1998, p. 14. Wikimedia Commons has media related to Diesel locomotives.